Grease buildup on the stovetop or countertop can be a bear to remove—unless you’re using the right cleaner. So what is the right cleaner? Vinegar! Just soak a sponge or rag in vinegar, and use it to wipe down the greasy surface. It’ll cut through the grease and grime in one easy step. Vinegar should only be used on non-porous surfaces such as metal or glass or sealed countertops. If you don't like the smell of undiluted vinegar, you can dilute it with water. One part vinegar to two parts of water is a good place to start. You can even add a few drops of a fragrant oil or lemon juice to it if you want to have a better scent. The acetic acid in vinegar eats through the grease, saving you scrubbing time and frustrations. Inexpensive: Vinegar is dirt cheap, and you probably don't even need to go out and buy any just for this purpose. You probably have vinegar in your pantry already, and you only need a dab to do the grease-cutting job. No harsh chemicals or fumes: Vinegar has a simple chemical structure, and we enjoy it all of the time in salad dressing, condiments, and as an ingredient in many recipes. While vinegar has a sharp odor, you don't have to fear inhaling it when it's used for cleaning purposes. No perfumes or artificial scents: If you or your household members are allergic to scents, cleaning with vinegar is a good solution. You will avoid the scent added to many commercial cleaning products. 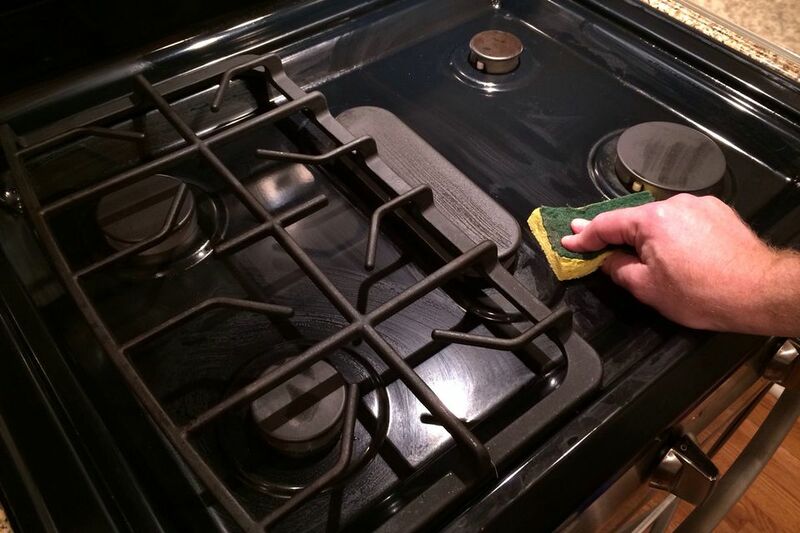 Safe for most non-porous surfaces: You can clean metal and glass surfaces and many countertops with vinegar. You should avoid using vinegar on marble, wood, and porous tile, and you don't want to leave a puddle of it in contact with stainless steel for hours. Safe for use around pets and kids. While you don't want them splashing vinegar in their eyes, you don't have to worry about them touching or licking a surface that was just cleaned with vinegar. It's safe on your salad so it's safe on tongues and fingers. Save space in your cupboards: You don't need to store special-purpose cleaning chemicals. You can use the same bottle of vinegar to make salad dressing or for cleaning. That said, once you begin to explore everything you can clean with vinegar, you may be buying it by the gallon rather than the pint. Do not use vinegar on marble. The acid in vinegar can damage marble, and that would be a costly problem. Test using vinegar on a small area before you use it on finished wood surfaces or tile. If the surface isn't fully sealed, you may see an effect. Better to only mar a tiny area than to clean the whole floor or furniture piece and then discover there is a problem. As with any cleaner, you should avoid all contact with the eyes and prolonged contact with the skin. While vinegar is safe when you eat it, the acid in it can be an irritant to sensitive areas.